Kanazawa, Japan – The remarkable discoveries and theories of physicists since the 1930s have shown that all matter in the universe is made from a small number of basic building blocks called fundamental particles. However, this isn't the complete story. Supersymmetry is a hypothesis in high-energy physics that aims to fill some of the gaps. Hajime Moriya from the Institute of Science and Engineering at Kanazawa University has shown that for an extended version of a pioneering model in non-relativistic supersymmetry-the Nicolai supersymmetric fermion lattice model-supersymmetry is broken for any nonzero value of a particular adjustable constant. Supersymmetry predicts that two basic classes of fundamental particles, fermions and bosons, accompany each other in the same representation. Fermions, such as quarks, have a half a unit of spin, which is an intrinsic form of angular momentum, and bosons, such as photons, have zero, one, or two units of spin. In 1976, Hermann Nicolai proposed the fermion lattice model, which is made by fermions with no bosons, but supersymmetry is still satisfied. 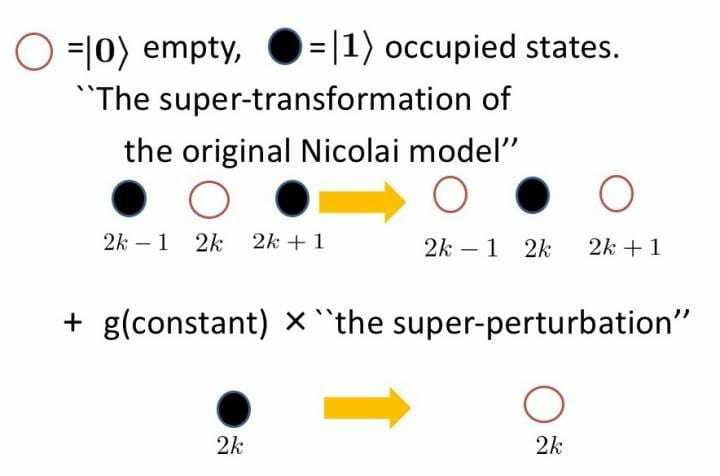 Nicolai's original model was extended by Noriaki Sannomiya et al., who showed that for any nonzero adjustable constant g ? ? on finite systems, supersymmetry breaks down. However, in the infinite-volume limit, they verified that supersymmetry breaks down only when g > g0 ? 4/π. "This restriction on parameter g seems to be technical," says Moriya, "and its meaning in terms of physics is unclear." So, Moriya considered spinless fermions over an infinitely extended lattice and removed the restriction on g in the case of the infinite-volume limit. Moriya showed that for any nonzero g, the extended Nicolai model breaks supersymmetry dynamically. In addition, the original Nicolai model has been shown to have highly degenerate vacua, also known as supersymmetric ground states. Moriya also proved that for any nonzero g, the energy density of any homogeneous ground state for the extended Nicolai model is strictly positive. "Even if supersymmetry is broken for any finite subsystem, it may be restored in the infinite-volume limit," explains Moriya, "as exemplified by some supersymmetry quantum mechanical model." So, Moriya showed that such a restoration does not occur for the extended Nicolai model. "The breaking of supersymmetry is verified in a rather model-independent manner by applying C*-algebraic techniques, which seem not well known in physics community," adds Moriya.